I decided it was time that I own a copy of Mastering the Art of French Cooking. What's the first recipe everyone makes from this classic? Beef Bourguignon, of course. The recipes in this cookbook are laid out differently than any other cookbook I've used. Instead of a list of ingredients preceding the directions, the ingredients needed for each step are listed in a column next to the directions. It feels a little blasphemous to criticize this beloved piece of American history, but I have a lot of difficulty following the recipes. I also find it a tad bit confusing, and at times, frustrating, to have to flip back to a previous recipe rather than having each recipe presented in it's full glory. I assume this was done in order to have one book instead of six volumes? So the first time I made Beef Bourguignon, I flubbed it up completely. I'm talking total disaster. It wasn't until I reread the recipe before making it a second time that I realized it was my fault and I had missed a crucial direction. Looking back, I should have known something was off but I was trusting myself to Julia. The second time with Beef Bourguignon was much better and the results were fabulous. Simple, elegant, and utterly delicious. So I set out to make another dish and chose one of the roasted pork dishes. I took a few liberties here, mainly with the cut of meat, not parboiling the potatoes, and a few other changes. The end result was a pork that was super tender and vegetables full of flavor. The bacon added saltiness and some texture. Perfect for a cool fall evening. 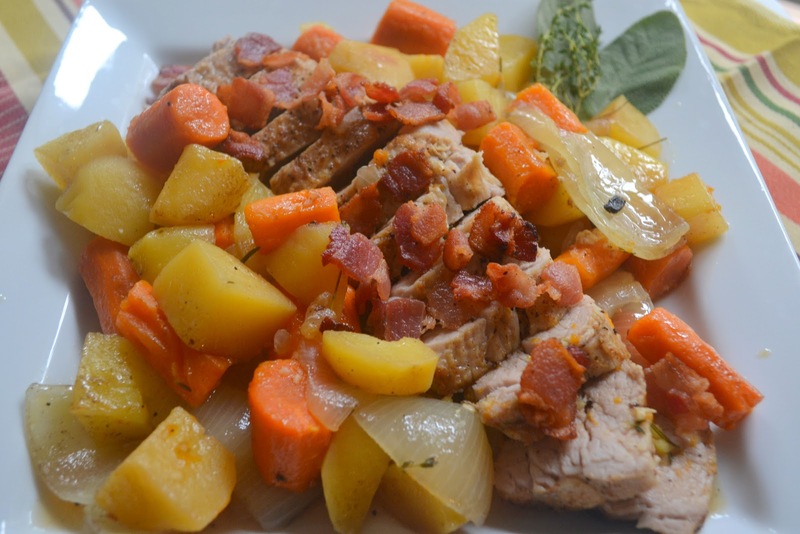 Casserole-Roasted Pork with Potatoes and Onions (and Bacon)! Fry bacon in a Dutch oven or heavy casserole pan with lid until crisp. Meanwhile, season pork with salt and pepper. Remove bacon with a slotted spoon and place on paper towels to drain. Casserole should be over medium-high to high heat. Add the pork, and sear on all sides to develop a nice crust. Remove the tenderloins, place on a plate, and set aside. Add butter to pan. Next add onions and carrots, and toss vegetables in fat and cook until the onions are translucent, about 8 minutes, Add garlic and herbs and cook for another minute. Pour in chicken stock and scrape any bits from the bottom of the pan. Add the potatoes, toss the mixture together and place the pork, along with any juices that accumulated on the plate, on top of the vegetables. Put the lid on the casserole and place in the oven. Cook until the meat is about 155 degrees F, about 45 minutes. Place pork on a platter, pile vegetables around and add some of the remaining sauce. Toss with crisped pan. Looks great! I understand what you mean regarding the cookbook. It's a little frustrating but the recipes are classics.